Picked fresh from the farm to offer your special recipient a bouquet blooming with a sweet appeal, the Lavender Fields Mixed Flower Bouquet is set to send your warmest greetings to friends and family near and far. 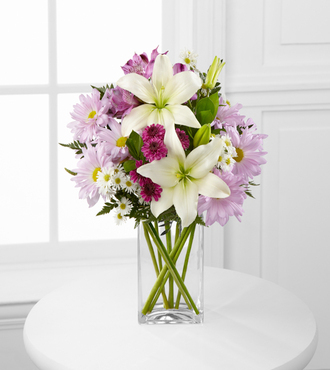 Hand gathered in select floral farms and boasting a soft array of enchanting colors, including lavender, purple, and white, this gorgeous flower arrangement has been picked fresh for you to help you celebrate a birthday, or express your thank you or get well wishes. This bouquet includes the following: white Asiatic Lilies, lavender traditional daisies, white monte casino asters, purple Peruvian Lilies, purple button poms, and an assortment of lush greens. Available with a wide variety of vases to suit your every gifting need. Bouquet is approximately 13"H x 12"W. * May Arrive in Bud Stage.